How does a sports entity implement a decision that will be highly controversial with their fanbase? Acclimatize them! Below are two cases. A few years back when I heard news that FC Barcelona, one of the few soccer clubs that for the longest time had never sported a corporate logo on their jerseys, were going to have UNICEF printed across their kits it was clear to me that this was simply the first step in Barcelona signing a proper shirt sponsorship agreement down the road. The UNICEF deal actually was kind of a reverse sponsorship in which Barcelona gave UNICEF free publicity by putting the organization’s logo on the club’s kits along with a substantial financial donation. Such a deal made it very difficult for traditional Barcelona fans who ardently cherished the fact that their club never sported any sponsorship logos on its uniforms to protest the move. After all, what type of heartless soul would complain about helping a charity that saves the lives of children across the world? The deal with UNICEF was a shrewd one. It was a way to acclimatize Barcelona fans to eventually seeing corporate sponsorship logos on their prized jerseys. Soon after the UNICEF deal, Barcelona had an agreement that placed Qatar Foundation’s logo on the front of their kits. Even though Qatar Foundation, like UNICEF, is a charity, this time it would be the foundation or their backers (Qatar Sports Investment) that would pay Barcelona – a whopping 30 million Euros a year. The partnership of a charity giving money to a club was an odd one, thus it probably left Barcelona fans scratching their heads instead of marching against the club’s directors. 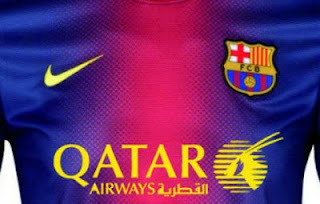 Shortly after the Qatar Foundation deal, the inevitable news that a corporate logo would appear on the Barcelona shirts was disclosed. Qatar Airways would now "conveniently" replace Qatar Foundation as Barcelona's shirt sponsor. See what they did here: Charity logo (free) à Charity logo (paid) à Corporate Sponsor logo. So in a few short years Barcelona went from a club that would perhaps never sport a corporate logo on their jerseys to one that will potentially have the largest shirt sponsorship deal on the planet. All that with limited fuss from their rabid fanbase because of the club’s brilliant strategy in acclimatizing their fans to the sight of corporate logos on their kits. Another fabled football program (be it a different type of football) is attempting to steal Barcelona’s playbook. Notre Dame, a powerhouse in American college athletics, announced that they will move the majority of their athletic programs from the Big East Conference to the Atlantic Coast Conference (ACC). Furthermore, as a part of the deal with the ACC, Notre Dame’s football program, which has long been an independent, will play five ACC opponents annually. Like Barcelona fans that cherished their clean kits, Notre Dame fans take pride in the fact that their university is an independent in football and not affiliated with any conference. Any move to join a conference in football will most likely be met with great resistance by their fans. The Notre Dame leadership – who probably feel that joining a conference will be necessary down the road - seems to be using the same acclimatization tactics to get around this sensitive issue. First have most of their non-football teams leave the weaker Big East Conference for the stronger ACC. Tell fans that the condition for joining the ACC is that they would have to play a handful of football games annually against ACC foes. After a few years of fans becoming accustomed to playing ACC teams in football, undoubtedly the endgame is to make a full move to the conference. By then it will be much more palatable to the fanbase. Update: With the recent Big Ten expansion Notre Dame might be pressured to join a conference sooner than later.